The hot deformation behaviour of one 7XXX series aluminium alloy, 7A04, has been studied by conducting isothermal hot compression tests with degree of compression up to 55% at the temperature ranging from 350 °C to 480 °C and strain rates ranging from 0.002 s−1 to 20s−1. Based on characteristic of the flow stress obtained from those tests, an extended Voce equation, which constant parameters were modified as Arrhenius-type type equation, was given and used to calculate the flow stresses under the conditions of the hot deformation. The parameters of extended Voce equation were determined by experimental results. The comparison between the experimental and predicted flow stress values at the hot compression parameters range indicated good agreement. The average absolute relative error, root mean square error and the correlation coefficient were found to be 4.9%, 4.8 MPa and 0.997, respectively, which confirmed the extended Voce model had good accuracy. Additional, a finite element simulation model of isothermal hot compression process was used to verify the new Voce equation and the results verified the accuracy of the new equation. 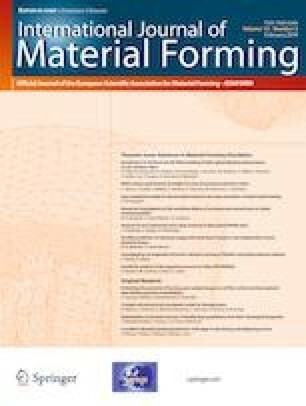 The main softening mechanism of the hot deformation was dynamic recovery and was confirmed by optical microstructures.